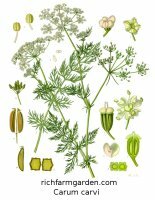 Caraway - Carum carvi - Annual or Biennial; Culinary, Medicinal - Foliage is feathery and fine, resembling that of carrots. Pink or white flowers are borne on brackets and later mature into the crescent shaped seeds used to flavor ryebreads, buns & cakes. Roots can be cooked like parsnips and the seeds are used to flavor liqueurs, such as Kummel & schnapps. Medicinally, caraway is used as a digestive aid, to treat rheumatism, eye infections and toothache. Full sun; plant height: 24-36in.